The Bank of England’s Quarterly Inflation Report is one of the most important pieces of documents released by the central bank. The Inflation Report includes the central bank’s latest growth and inflation forecasts and frequently telegraphs their plans for monetary policy. Although the Monetary Policy Committee has not changed interest rates in nearly 2 years, they getting close to raising rates and because of that, investors are watching their every move. The publication of the Inflation Report is rarely a nonevent for the GBP/USD. 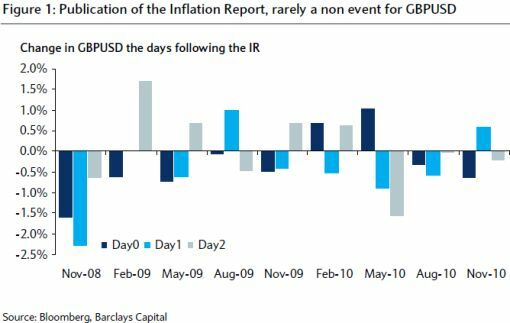 The following chart from Barclays Capital shows the rollercoaster like reaction in the currency pair days after the report is released. With the Bank of England upgrading its inflation forecast and downgrading its growth forecasts, sterling traders are as confused as ever and this confusion could turn into volatility for the British pound. The sell-off in the GBP/USD today indicates that the Quarterly Inflation Report was not nearly as hawkish as investors had hoped but many economists are still looking for the BoE to raise rates this year. In the short term, the less hawkish tone of the report could lead to additional position adjustments in the GBP but in the long term, the GBP is still headed higher because the BoE remains at the verge of raising interest rates. There is no question that the U.K. central bank will tighten before the Federal Reserve.